Let me explain. All modern economic theories have a utopian moment. In the case of mainstream economics, that moment is a full-blown utopianism—the idea that there is, or at least in principle can be, a perfectly functioning economic and social order. Such an order is both envisioned as a model within the theory (often by stipulating the minimum set of theoretical requirements) and advanced as the goal of economic policies (which move the economy to, or at least toward, the utopia). In this sense, utopia—of sovereign individuals, free markets, and private property—is the fundamental premise and promise of mainstream economic theory. The Marxian approach is otherwise. Certainly Marxian economists (and social thinkers generally) imagine that the world can and should be radically different from what currently exists. They simply wouldn’t engage in their intellectual and political work if that weren’t the case. But, instead of drawing up a blueprint of what such an alternative might look like, Marxists are engaged in a “ruthless criticism of all that exists, ruthless both in the sense of not being afraid of the results it arrives at and in the sense of being just as little afraid of conflict with the powers that be.” It is a ruthless criticism of both mainstream economic theory and of the economic and social system celebrated by mainstream economists. This is an argument I’ve made many times, in different ways, over the course of my various talks (e.g, here), papers (e.g., here and here), and posts on utopia in recent years. Here, I want to take the argument one step further. What distinguishes Marxian theory from both mainstream economics (and, for matter, from other criticisms of mainstream economics) is that is based on a materialist critique. That is its utopian moment. As I see it, the method of materialist critique is both dialectical and historical. ** It is dialectical to the extent that it involves the interpretation of economic categories—such as value, productivity, profit and much else—precisely as they are grounded in, deployed and disseminated within, the existing intellectual and social order. It takes those concepts as its own. But it doesn’t simply accept the existing interpretations of those categories but, instead, transforms them into their opposites. In other words, the critical acceptance of those categories is simultaneously their condemnation. The method of materialist critique also has an important historical dimension. It focuses on the ways both economic ideas and economic systems change over time, often with radical disruptions between them. Thus, for example, the theories used by economists today (and not only, if we allow for everyday economic representations) are radically different from themselves (in the sense that the terrain of economics is defined by multiple, diverse and incommensurable, concepts and methods) and from theories that have existed in the past (beginning with classical political economy and including the theoretical revolutions within mainstream economics as well as their heterodox counterparts). Similarly, capitalism has changed over time—both within its own history (capitalism today is different from what it was in the middle of the nineteenth century) and as it represents a break from other, noncapitalist systems (such as feudalism, slavery, and so on). A materialist critique focuses on such disruptions and divergences over time, thereby creating the possibility of other radical changes, such as an end to capitalism and the emergence of new, noncapitalist ways of organizing economic and social life. The most famous example in the Marxian tradition is the transition from feudalism to capitalism. Notwithstanding the wide-ranging debate about the causes and consequences of that transition (among such figures as Maurice Dobb, Paul Sweezy, Robert Brenner, and Stephen Resnick and Richard Wolff), the fact is capitalism had a definite beginning as it emerged from the crises of feudalism in Western Europe (and therefore didn’t always exist, as mainstream economists often presume and proclaim), which also makes it possible to imagine an end to capitalism (based, of course, on the accumulation and aggregation of political and social forces that are opposed to capitalism and imagine and seek to create the conditions for noncapitalist economic and social institutions). Much the same is true in economic thought: mainstream economics today (neoclassical microeconomics and Keynesian macroeconomics) represents a radical break from previous mainstream economic theories (such as the classical political economy of Adam Smith and David Ricardo), as well as the various alternatives to mainstream economics that have emerged alongside it from the very beginning (which are often overlooked in “official,” mainstream histories of economic thought). A materialist critique therefore highlights the absence of history—the history of ideas as well as the history of economic systems—within mainstream economics and capitalism itself. In the way I am defining materialist critique, it does not represent a simple opposition to contemporary thought and society. On the contrary, it is grounded in them, using their categories as starting points with the aim of substantially and radically transforming them. If materialist critique represents the utopian moment of Marxian theory, it stands opposed to the specialized knowledge of mainstream economics (and, by extension, of the rest of the modern social sciences) as well as to traditional interpretations of Marxian theory. It differs from contemporary mainstream economics in that it seeks to transform—both dialectically and historically—the existing set of categories instead of accepting them as the given parameters of economic and social life. It of course uses those knowledges as raw materials but only for the purpose of turning them into their opposites. And it is distinguished from the precepts and protocols of dialectical and historical materialism in that it is rooted in the categories that pertain to mainstream economics and capitalism, in order to do battle on that terrain, not a set of sui generis categories (often governed by a humanist anthropology or rational discourse) to establish a new and different science comparable to mainstream economics. And to be clear, materialist critique is not the same thing as economism (with which materialism is often conflated). On the contrary. In fact, materialist critique represents a ruthless criticism of economism not because it gives too much importance to the economy, but because it gives it too narrow a scope. Economism takes the economy as a given, transmitting its effects to individuals and to the rest of the social structure—instead of focusing on the problem of the complex, changing relationship between the economy and individual and social lives. In the end, the goal of a materialist critique is to denaturalize and thus disrupt the existing common sense—within both economic thought and capitalism—with the aim of radically transforming the existing theoretical and social reality. It doesn’t accomplish this alone, of course. Those who are engaged in a materialist critique as well as their specific objects form a dynamic, dialectical unity with the exploited classes as both an expression of the concrete historical situation and a force to stimulate change. Nor are there any guarantees, from either side of the relationship or in the often-tense unity itself. Notwithstanding its aleatory nature, the process of materialist critique starts with the categories that dominate economic thought and the economy itself in order to transform them into their opposites, thus creating new intellectual and political possibilities. The new openings created by materialist critique represent the utopian horizon of Marxian theory. *The series, thus far, consists of posts on the Bitcoin bubble, the right to be lazy, populism, the economics of control, utopian socialism, inequality, international trade, healthcare (here and here), the disaster in Puerto Rico, epistemology, value theory, macroeconomics, economic development, markets, technology, work, and mathematics. **Besides Marx’s own writings, an essay that serves as the catalyst for some of my ideas in this post is Max Horkheimer’s “Traditional and Critical Theory” [ht: db], reprinted in his Critical Theory: Selected Essays, trans. Matthew J. O’Connell and others (New York: Continuum, 2002). ***Moreover, such a system is neither free nor fair for both capitalists and workers. Each is subject to the compulsions and coercions embedded in such a system, albeit in a different way. While Amazon let it slip last week that its Prime program—the annual membership that offers discount pricing and free 2-day shipping—now tops 100 million members, there’s another number people might be curious about: the company’s average annual wage, which Amazon revealed in compliance with a new regulation that asks companies to show a comparison between an average worker’s wage and the salary of their CEO. Amazon has reported an average compensation for its varied, mostly warehouse (and now, with Whole Foods, grocery store), workers at $28,446 a year. The federal government defines its poverty guideline for a family of four to be $25,100. So, Amazon’s average wage falls easily within 150 percent of the poverty line—and stands at about one-half of the median household income in the United States. No wonder, then, that Amazon is owned and run by literally the richest man in the world, Jeff Bezos. While he technically “made” only $1.7 million last year, he’s worth $127 billion. * So it means on paper, Bezos makes $59 for every dollar an average employee earns, which is actually a smaller ratio than the average of 271 to 1 for the largest 350 U.S. corporations (pdf). While Amazon may not have been thrilled by being forced to reveal this not-so-flattering wage comparison, they do have one thing going for them: the only private employer bigger than the e-commerce giant is their retail competitor Walmart, whose workers average only $19,177 per year, putting them far under the federal poverty guidelines. Moreover, the ratio to average-worker pay of Walmart CEO Doug McMillon, who took in $22.8 million last year, was an astounding 1,188 to 1. And the extraordinary numbers continue, across the economy. Royal Caribbean Cruises: 728-1. Regeneron Pharmaceuticals: 215-1. Netflix: 133-1. Live Nation Entertainment: 2,893-1. Honeywell International: 333-1. Fidelity National Information Services: 654-1. UnitedHealth Group: 298-1. And on and on. 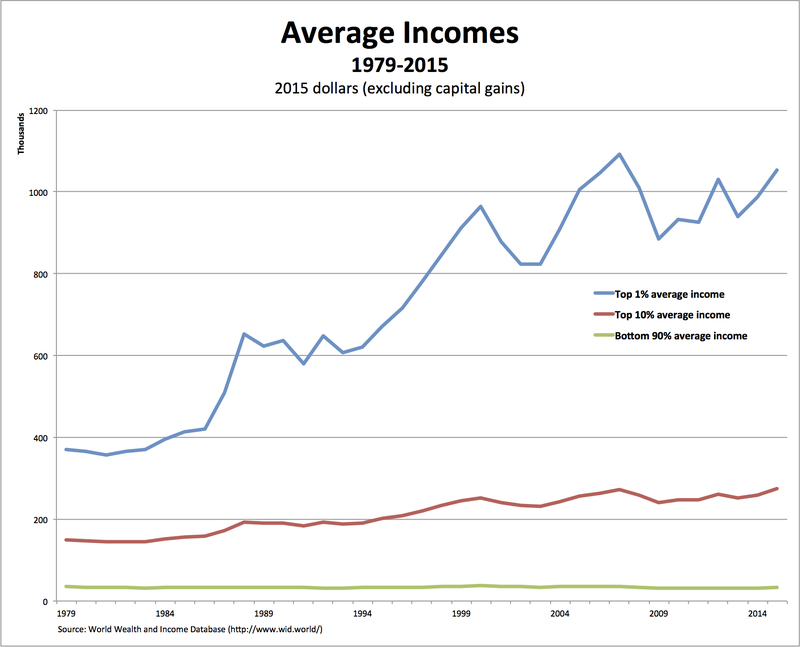 Each such ratio indicates the obscene level of inequality in the United States, based on the amount of surplus pumped out of workers and distributed to those who run American corporations on behalf of their boards of directors. 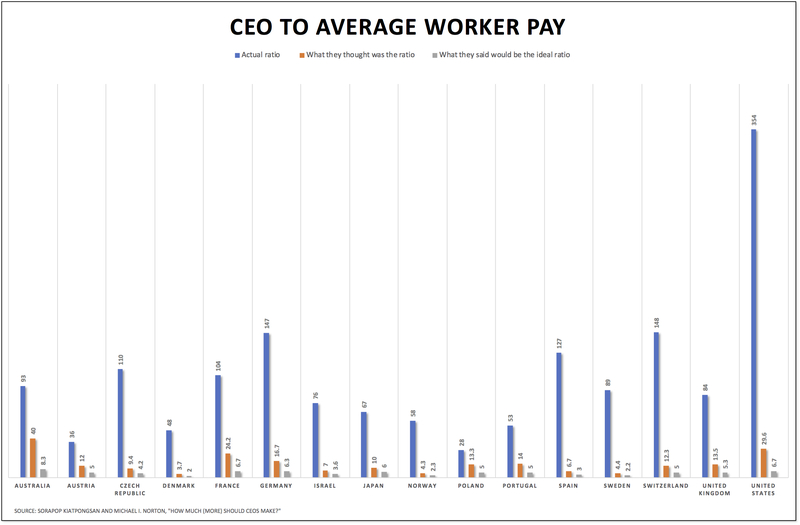 While the figures of CEO-to-average-worker-pay are being reported in the business press, they have not been widely discussed in the media or by the nation’s politicians. It should come as no surprise, then, that Americans underestimate—by a wide margin—the degree of inequality in the United States. In a 2014 study, Sorapop Kiatpongsan and Michael Norton asked about 55,000 people around the globe, including 1,581 participants in the United States, how much money they thought corporate CEOs made compared with unskilled factory workers. ** Then they asked how much more pay they thought CEOs should make. 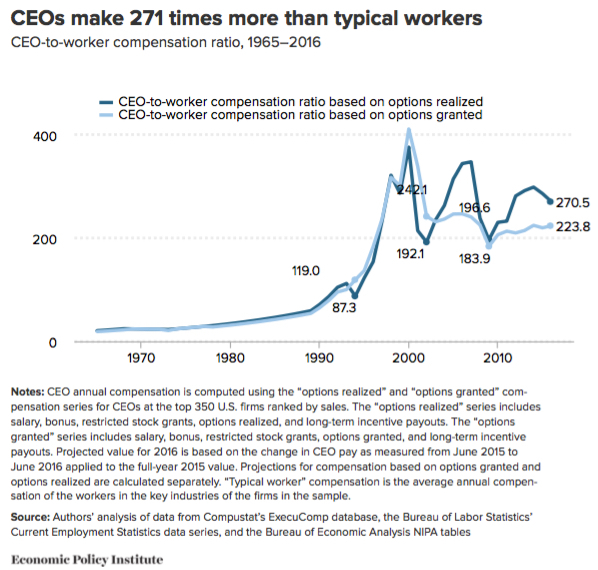 American respondents guessed that executives out-earned factory workers roughly 30-to-1—just about what that ratio was in the 1960s and exponentially lower than the actual estimate at the time of 354-to-1. They believed the ideal ratio should be about 7-to-1. As it turns out, Americans didn’t answer the survey much differently from participants in other countries. Australians believed that roughly 8-to-1 would be a good ratio; the French settled on about 7-to-1; and the Germans settled on around 6-to-1. In every country, the CEO pay-gap ratio was far greater than people assumed. And though they didn’t concur on precisely what would be fair, both conservatives and liberals around the world also concurred that the pay gap should be smaller. People also agreed across income and education levels, as well as across age groups. Because representations of the economy that minimize the existence of inequality or the problems associated with inequality are bound to reinforce the systematic misperceptions found by Norton and others. That’s exactly what much mainstream economics accomplishes. It deflects attention from the existence of inequality (e.g., by focusing on growth, output, and the price level versus distribution) and from the economic and social problems created by inequality (by attributing the growing gap between the haves and have-nots to forces like globalization and technological change that are beyond our control or invoking more education as the only solution). Mainstream economics therefore forms part of what others (such as Vladimir Gimpelson and Daniel Treisman) refer to as “ideology,” “which may predispose people to ‘see’ the level of inequality that their beliefs and values convince them must exist.” And the strength of mainstream economics in the United States—in colleges and universities as well as in the media, think tanks, and in government—and around the world is one of the main reasons Americans, like people in other countries, tend not to see the existing degree of inequality. On the other hand, the ideology of mainstream economics is never complete. That’s why Americans and citizens around the globe do see that the degree of inequality created by existing economic arrangements is fundamentally unfair. It’s that sense of unfairness, which is only partially masked by mainstream economics, that can serve as the basis for a radical rethinking and reimagining of contemporary economic and social institutions. *Bezos [ht: sm] received a hostile reception from workers when he arrived in Berlin to pick up an innovation award last Tuesday. As Frank Bsirske, the head of the Verdi trade union, explained: “We have a boss who wants to impose American working conditions on the world and take us back to the 19th century.” Meanwhile, back in the United States, Amazon reported that its profits more than doubled to $1.6 billion in the first quarter of 2018, sending shares of its stock soaring to an all-time high. **This is the second high-profile paper in which Norton discovered that Americans have a notion of economic fairness that is strikingly more equal than the current reality, and more equal even than their own underestimate of the degree of inequality. For over a century, the most effective way to stop attempts to reduce healthcare disparities in the United States has been to invoke the fear of “socialized medicine.” As a result, Americans have ended up with socialized inequality in their healthcare system. According to a new study by Joachim O. Hero, Alan M. Zaslavsky, and Robert J. Blendon published in Health Affairs (unfortunately behind a paywall), 67 percent of respondents in the health module of the General Social Survey believed that “many” people in the United States do not have access to the health care they need. This is over 10 percentage points higher than the level in any other country, and over twice the median country rate of 31 percent. And even though only 54 percent of respondents viewed income-based differences in the quality of health care that people have access to as unfair (much lower than the median country rate of 68 percent), the majority of respondents—54 percent of those who viewed income-related disparities as fair and 73 percent of the respondents who viewed such disparities as unfair expressed their support for major health system reform. And reform is, of course, necessary. The United States has the third-highest disparity—behind only Chile and Portugal—at 25.9 percentage points. * Among US respondents, 38.2 percent in the bottom income tertile reported fair or poor health, compared to 21.4 percent in the middle tertile, and 12.3 percent in the top tertile. While many countries exhibited consistent disparities in health care across measures of access and care satisfaction, most had mixed or negligible disparities in all measures. The United States stands out by exhibiting large disparities in most measures, making it unique among high-income countries. In fact, the United States had the second-largest disparity in people forgoing needed medical treatment because they could not pay for it, at 16.5 percentage points (behind only the Philippines), and the third-highest disparity in people believing they would get the best treatment available in their country if they were seriously ill, at 15.5 percentage points (behind only Chile and Bulgaria). We often forget that the Affordable Care Act, in addition to extending health insurance, bolstered efforts to address socialized inequality in a number of other ways, including improved standards for data collection, support for disparities research, provisions to support diversity in the health care workforce, and the funding of demonstration programs aimed at reducing health disparities. 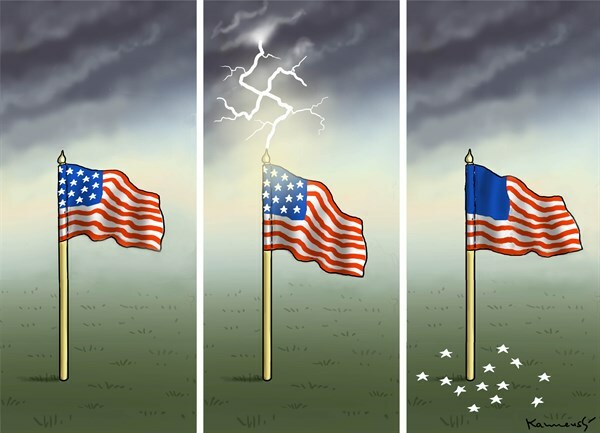 Eliminating these efforts without providing clear alternatives would risk taking a step backward in an area where the United States is in sore need of improvement, and in a political environment where solutions with broad support are increasingly hard to find. *Disparity is defined by the authors as the percentage-point difference between respondents in the top and bottom income tertiles. I find myself thinking more these days about the fairness of Social Security and other government retirement benefits. One reason, of course, is because I’m getting close to retirement age—and, as I discover each time I raise the issue with students, young people don’t think about it much. * Another reason is because Social Security (in addition to Medicare, Disability, and other programs) is the way the United States creates a collective bond between current and former workers, by using a portion of the surplus produced by current workers to provide a safety net for workers who have retired. That represents a kind of social fairness—that people who have spent a large portion of their lives working (most people need 40 credits, based on years of work and earnings, to qualify for full Social Security benefits) are eligible for government retirement benefits provided by current workers. Another aspect of that fairness is the system should and does redistribute from those with high lifetime incomes to those with lower lifetime incomes. While that makes the actual “rates of return” unequal across groups, it’s designed to provide a floor for the poorest workers in society. Here’s the problem: retirement benefits in the United States are increasingly unequally distributed on a non-random basis. 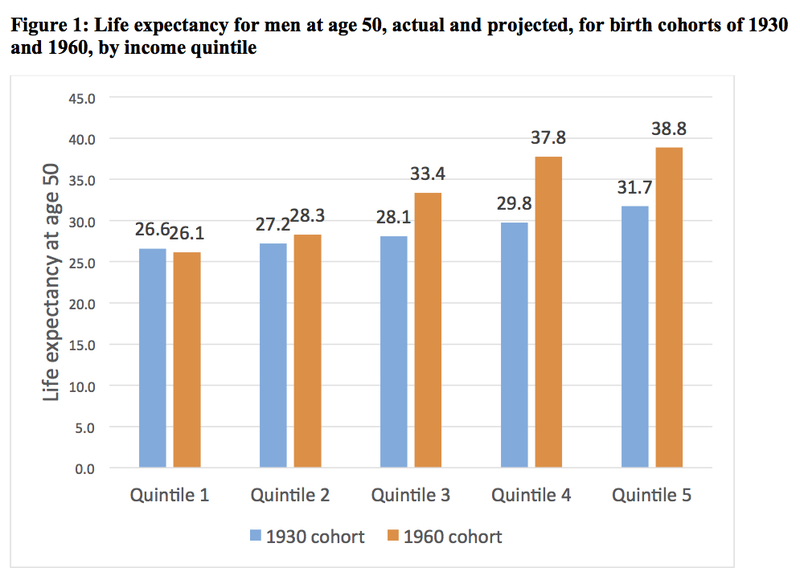 As I’ve written about many different times (e.g., here, here, and here), there’s a gap in life expectancies between those at the bottom and top of the distribution of income. 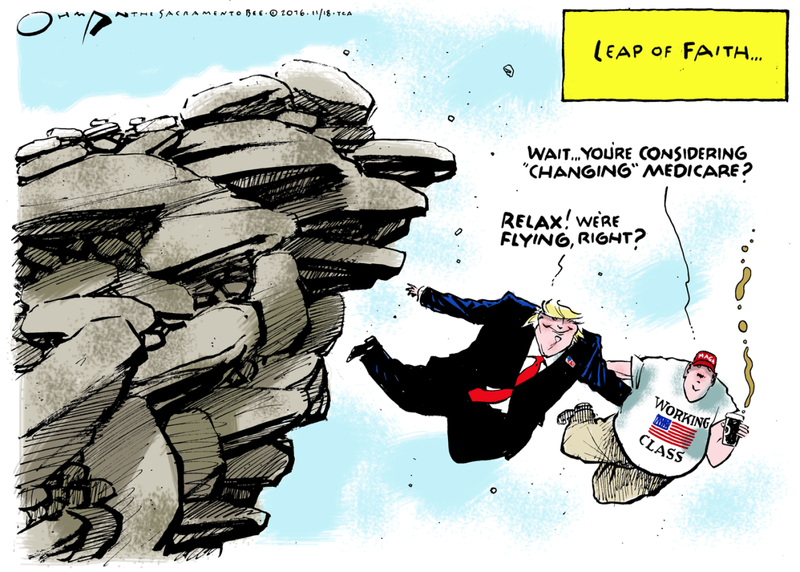 And the gap has been growing over time. Not surprisingly (since benefits rise with earnings), Social Security benefits also rise with income quintiles. Thus, for example, for men in the 1930 cohort, workers in the lowest quintile can expect to receive, on average, $126 thousand in benefits over the rest of their lives (discounted to age 50), while workers in the top quintile can expect to receive $229 thousand, or 82 percent more than the lowest income workers. What is particularly troubling is how the results change when we move to the 1960 cohort. 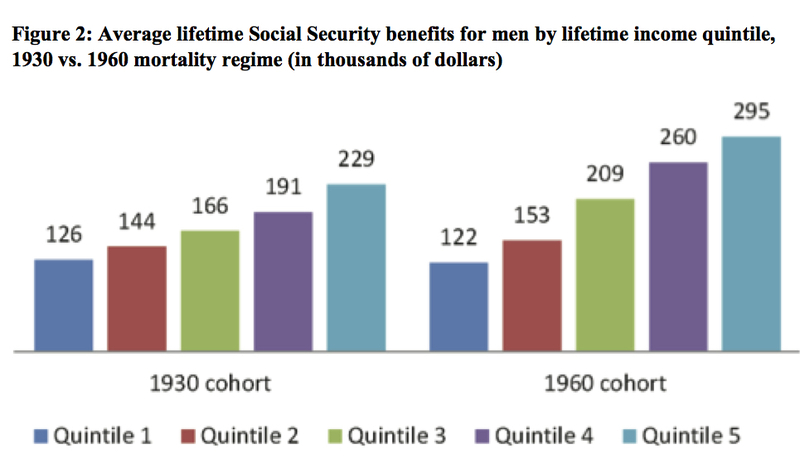 The additional 6-8 years of life expectancy for the top three quintiles lead to large increases in expected Social Security benefits, with benefits for the top quintile reaching $295 thousand. The difference between the highest and lowest quintiles is then expected to be $173 thousand, or 142 percent of the lowest income workers’ benefit. These results suggest that Social Security is becoming significantly less progressive over time due to the widening gap in life expectancy. Not only does the growing gap in life expectancies undermine the basic fairness of the Social Security system. It calls into question capitalism itself. *For understandable reasons. I certainly didn’t think about retirement at that age. (I barely thought about getting a job. I just presumed I would—and would be able to—at some point.) However, when students are induced to do think about retirement, as I’ve written before, most take it for granted that Social Security is doomed. While they expect to pay into Social Security, they don’t expect to receive any Social Security benefits when they retire. Then, of course, I explain to them that making only one change—raising the taxable earnings base—would eliminate the projected deficit and keep Social Security solvent forever. Is it any surprise, as Christina Starman, Mark Sheskin, and Paul Bloom argue, that fairness is not the same thing as equality? There is immense concern about economic inequality, both among the scholarly community and in the general public, and many insist that equality is an important social goal. However, when people are asked about the ideal distribution of wealth in their country, they actually prefer unequal societies. We suggest that these two phenomena can be reconciled by noticing that, despite appearances to the contrary, there is no evidence that people are bothered by economic inequality itself. Rather, they are bothered by something that is often confounded with inequality: economic unfairness. 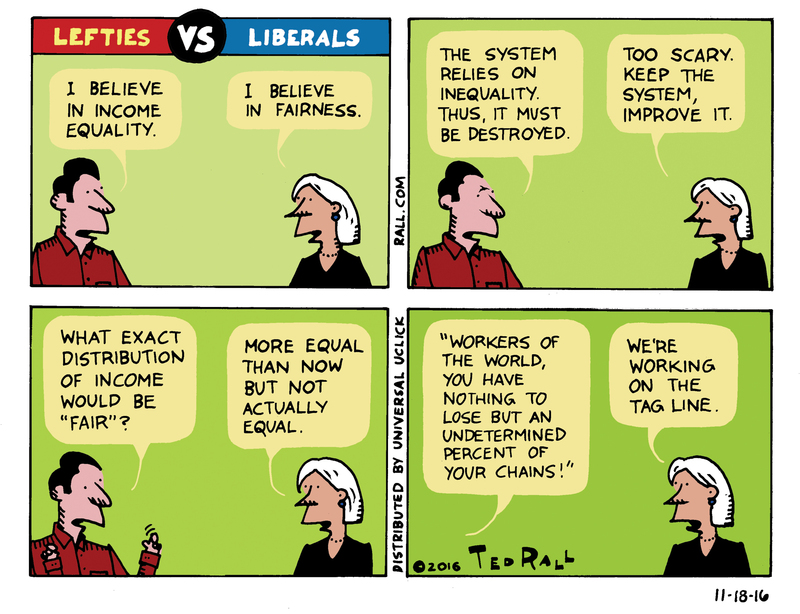 Still, I think, many people today are bothered by both—economic unfairness and grotesque levels of economic inequality. Let me explain. As I have written before, I’m not particularly convinced of the idea being promoted by Starman et al. and by other evolutionary psychologists that fairness is part of humans’ biological inheritance. Instead, I’m more inclined to look in the direction of history and society. Fairness is an important part of the self-justification of bourgeois society. For example, market outcomes are considered fair because sovereign individuals are free to engage in voluntary transactions, which result in equal exchanges. That’s an idea that is created and reproduced throughout contemporary society, especially in mainstream economics. By the same token, it’s not particularly shocking that those same individuals agree there should be some degree of inequality in economic outcomes. That’s also part of capitalism’s self-justification, that “fair” processes will produce unequal results. So, people seem to agree, not everyone can or should receive the same income or have the same wealth. We have different abilities, needs, desires, and circumstances, so the discourse goes, resulting in—perhaps even requiring—different amounts of income and wealth. But then, of course, income inequalities have become so obscene—so unjustified by any conceivable differences in abilities, needs, desires, and circumstances—that, in the name of fairness, people demand more equality. That’s how I think we need to reconcile the ideas of fairness and equality—not, as Starman et al. would have it, that people are bothered by fairness but not by inequality, but instead that bourgeois notions of fairness are so challenged and disrupted by existing levels of inequality people demand perhaps not perfect but certainly much more equality than exists today. 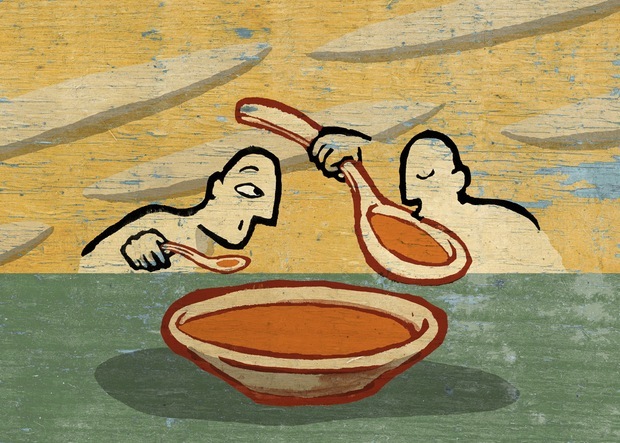 The real question is not whether there’s a “universal moral concern with fairness.” Instead, it’s whether the existing system can deliver on its promise to create fair (and, with them, more equal) outcomes—or, alternatively, whether it’s necessary to imagine and create a different set of economic and social institutions, which will actually fulfill that promise of fairness and at the same time deliver much more equality than exists in the United States today. According to the norms of both neoclassical economic theory and capitalism itself, workers’ wages should increase at roughly the same rate as their productivity. * Clearly, in recent years they have not. The chart above, which was produced by B. Ravikumar and Lin Shao for the Federal Reserve Bank of St. Louis, shows that labor compensation has grown slowly during the recovery of the U.S. economy from the 2007-09 recession. In fact, real labor compensation per hour in the nonfarm business sector was 0.5 percent lower 20 quarters after the start of the recovery, while labor productivity had increased by 6 percent. Clearly, the gap between worker compensation and productivity has grown during the current recovery. But the authors go even further, showing that the gap in the United States between compensation to workers and their productivity has been growing for decades. The data in Figure 3 show that the productivity-compensation gap—defined as labor productivity divided by labor compensation—has been increasing on average by approximately 0.9 percent per year since 1970:Q1. Based on this long-term trend, the gap would have been 51 percent higher in 2016:Q1 compared with 1970:Q1; in the data, the gap is actually 47 percent higher. Clearly, the recent and long-term trends of productivity and labor compensation challenge the norms of neoclassical economics and of capitalism itself. But we are also seeing the growth of another gap—between the promises of both neoclassical theory and capitalism and the reality workers have faced for decades now. *Neoclassical economics—in particular, the marginal productivity theory of distribution—is based on the idea that the factors of production (land, labor, capital, and so on) receive in the form of income what they contribute to production. So, for example, as labor productivity increases, real wages should also rise. Similarly, capitalism is based on the idea of “just deserts.” That idea—that everyone gets what they deserve—is essential to the very idea of fairness or justice in the way the economy is currently organized. **The authors’ analysis is based on the gap between labor compensation and productivity. If we look at real wages (as in the chart below) instead of compensation (which includes benefits, and therefore the portion of the surplus employers distribute to pension plans, healthcare insurers, and others), the gap is even larger. According to my calculations from Fed data, since 1979, productivity has grown by 60 percent while real wages have increased by less than 5 percent.